The Warwick surname is English in origin. The earliest known members of our family were living in Massachusetts in the late 1600s. Although the proper spelling of the name is "Warwick", the majority of our family spelled their name Warrick or Worrick in contemporary records. Most branches of the family had eventually standardized the spelling as Worrick. Chasling Worrick was born circa 1690, possibly in Massachusetts. He died on April 27, 1749 in Hingham (now Cohasset), Plymouth Co., Massachusetts 1. Chasling's parents or origins are not known. He may have been related to John, Elizabeth, and Joseph Worrick who appear in Boston during the same time that he did, the early 1700s. Sometime in his youth Chasling probably settled in Boston, Massachusetts, with some family. He must have traveled from Boston to Hingham though because in March 1717/8 he filed intentions to marry Hester Bates in Hingham, Mass. They were married on April 4, 1718 in Boston and afterwards settled in Hingham. By his marriage to Hester, Chasling had 8 children: Susanna, Joseph, Elizabeth, Jael, George, Ann, Sarah, and Jonathan. His wife Hester died in 1739 at the age of 41. Chasling remarried on November 22, 1739 in Hingham, Mass., to Susanna Sutton, a widow. They had 4 children together: Hezekiah, Lydia, Esther, and Jesse (see next generation). Chasling was by occupation a shoemaker and lived at Hingham, Plymouth County, Massachusetts. The part of town he lived in afterwards became the town of Cohasset in Norfolk County, Massachusetts. It is said that Chasling lived "on the Common" in what is became Cohasset. Chasling was drowned on April 27, 1749, probably near his home in Hingham, Massachusetts. His estate was appraised on May 10, 1750. The house he lived in was apparently torn down in the year 1794 and a house was rebuilt at the same location which was still standing in 1909. Chasling married first Hester Bates in March 1717/8 in Hingham, Plymouth Co., Massachusetts 1 on April 4, 1718 in Boston, Suffolk Co., Massachusetts. She was born on September 14, 1697 in Hingham, Plymouth Co., Massachusetts 1. She died on February 7, 1738/9 in Hingham (now Cohasset), Plymouth Co., Massachusetts 1. 1 Susanna Worrick was born on August 29, 1718 in Hingham, Massachusetts 1. She married Nathaniel Marble on November 25, 1735 1. 2 Joseph Worrick was born on April 22, 1721 in Hingham, Massachusetts 1. 3 Elizabeth Worrick was born on February 19, 1722/3 in Hingham, Massachusetts 1. She died on April 19, 1723 in Hingham, Massachusetts 1. 4 Jael Worrick was born on May 20, 1725 in Hingham, Massachusetts 1. She married Adam Beal on November 25, 1745 1. 5 George Wilson Worrick was born on March 20, 1726/7 in Hingham, Massachusetts 1. He died on Deember 11, 1735 in Hingham, Massachusetts 1. 6 Ann Worrick was born on February 14, 1728/9 in Hingham, Massachusetts 1. She died on March 19, 1728/9 in Hingham, Massachusetts 1. 7 Sarah Worrick was born on July 30, 1730 in Hingham, Massachusetts 1. She died on August 4, 1783 1. She married Joseph Hobart on November 15, 1750 1. 8 Jonathan Worrick was born on October 26, 1732 in Hingham, Massachusetts 1. He married Mary Fetteridge on March 14, 1754 1. Chasling married second Susanna Tower on November 22, 1739 in Hingham (now Cohasset), Plymouth Co., Massachusetts 1. She was born at Hingham, Massachusetts on April 16, 1707 1. She died there after 1748. 1 Hezekiah Worrick was born on August 9, 1740 in Hingham, Massachusetts 1. He married Hannah Lane on November 18, 1764 1. 2 Lydia Worrick was born on November 17, 1742 in Hingham, Massachusetts 1. She married Abner Tower on April 20, 1762 1. 3 Esther Worrick was born on May 13, 1745 in Hingham, Massachusetts 1. She married Joseph Souther on May 13, 1769 1. Jesse Worrick was born probably in 1748 and baptized on September 11, 1748 in Hingham (now Cohasset), Massachusetts 3. He died on February 12, 1815 in Warwick, Franklin Co., Massachusetts 2. Jesse was raised in what is now Cohasset, where he married Keziah Orcutt on December 26, 1771. They lived in Cohasset for the next 10 years and had 4 children there: Susanna, Samuel, Hannah (see next generation), and Sally. In Cohasset, Jesse and his family lived in King Street. It was while living in Cohasset that Jesse served in the American Revolution. Jesse served in Capt. Job Cushing's Company in Col. John Greaton's Regiment. After the war was over, the family decided to move. In 1782 the family moved out west and settled in western Massachusetts in the town of Warwick, Franklin County, Massachusetts, close to the border with Vermont. In Warwick, Jesse and Keziah had 6 more children: Jesse Jr., Chloe, Betsey, Polly, Fanny, and Peter. Jesse lived in the Warwick, Mass., area for the rest of his life. It is possible that the family also lived close to or in the neighboring town of Orange. Jesse died in Warwick, Mass., on February 12, 1815, aged about 66. Jesse married Keziah Orcutt on December 26, 1771 in Cohasset, Norfolk Co., Massachusetts 3,8. She was born on October 11, 1750 in Hingham, Plymouth Co., Massachusetts 3. She died on November 22, 1814 in Guilford, Windham Co., Vermont 5,7. She is buried in the Blanchard (Old North) Cemetery, Guilford, Windham Co., Vermont. 1 Susanna Worrick was born on October 13, 1772 in Cohasset, Norfolk Co., Massachusetts 4. She died on May 22, 1846 in Guilford, Windham Co., Vermont. She married John Burnett on or soon after October 7, 1793 in Warwick, Franklin Co., Massachusetts. Susanna and John filed intentions to wed on October 7, 1793 in Warwick, Massachusetts, but is not known when or where the actual marriage occurred. Sometime soon after their marriage, they settled in nearby Guilford, Vermont, where they remained. 2 Samuel Worrick was born on October 24, 1776 in Cohasset, Norfolk Co., Massachusetts 4. He died after 1830 in Schoharie, Schoharie Co., New York. He married Polly Hill on or soon after October 17, 1800 in Warwick, Franklin Co., Massachusetts. She was born on January 24, 1777 in Massachusetts and died on March 16, 1867 in Tioga Co., New York. She is buried in the Whittemore Hill Cemetery, Tioga Co., New York. Samuel filed intentions to wed Polly Hill on October 17, 1800 in Warwick, Massachusetts. It is not known when or where the actual marriage occurred. They lived somewhere in Massachusetts within the first few years of marriage. Sometime between 1804 and 1810, they moved out west to Schoharie, New York, where they remained. Samuel probably died there before 1840. 4 Sarah "Sally" Worrick was born on September 16, 1781 in Cohasset, Norfolk Co., Massachusetts 4. She died in 1830 in Orange, Franklin Co., Massachusetts. She married John Battle on July 30, 1803. 5 Jesse Worrick was born on January 2, 1784 in Warwick, Franklin Co., Massachusetts 4. He died on September 27, 1861 in Orange, Franklin Co., Massachusetts. He is buried in the Jones Cemetery, Orange, Franklin Co., Massachusetts. He married first Joanna Ball. She was born on March 16, 1780 and died on March 2, 1815 in Orange, Franklin Co., Massachusetts. He married second Polly Metcalf in about 1815. She was born circa 1784 and died on June 17, 1845 in Orange, Franklin Co., Massachusetts. She is buried in the Jones Cemetery, Orange, Franklin Co., Massachusetts. 6 Chloe Worrick was born on October 22, 1785 in Warwick, Franklin Co., Massachusetts 4. She died on October 17, 1842 in Colrain, Franklin Co., Massachusetts. She married Job Stafford in about 1806. He was born circa 1780 and died on March 21, 1846 in Colrain, Franklin Co., Massachusetts. After marriage, Chloe and her husband moved relatively frequently. During the first 10 years of marriage, they apparently lived at Whitingham, Vermont; Cheshire, Massachusetts; and Preston, New York. 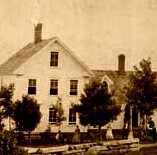 By the late 1810s they settled at Readsboro, Vermont, where they remained for many years. They later lived briefly in Guilford, Vermont before moving to Colrain, Massachusetts during the early 1840s. 7 Betsey Worrick was born on August 21, 1787 in Warwick, Franklin Co., Massachusetts 4. She died before May 8, 1827 in New Salem, Franklin Co., Massachusetts. Betsey was never married. Unusually, Betsey was a landowner as a single adult woman. She died sometime between 1824, when she was granted land in New Salem and May 8, 1827, when her first estate papers were filed. Her estate was divided equally between her surviving siblings. 8 Polly Worrick was born on March 2, 1790 in Warwick, Franklin Co., Massachusetts 4. She died on September 29, 1863 in Readsboro, Bennington Co., Vermont. She is buried in the South Hill Cemetery, Readsboro, Bennington Co., Vermont. She married John K. Stafford in November 1809 in Franklin Co., Massachusetts. 9 Fanny Worrick was born on April 26, 1792 in Warwick, Franklin Co., Massachusetts 4. She died on October 16, 1869 in Orange, Franklin Co., Massachusetts. She married Eli Forrester circa 1815. He was born circa July 1795 and died on August 10, 1870 in Orange, Franklin Co., Massachusetts. 10 Peter Worrick was born on September 12, 1794 in Warwick, Franklin Co., Massachusetts 4. He died after 1810. It is not clear what happened to Peter. He probably died relatively young, without having married or having any children. Some online family trees indicate he married Fanny Foster, but that is confusing him with his nephew Peter W. Worrick of New York. Hannah Worrick was born on September 28, 1778 in Cohasset, Norfolk Co., Massachusetts 4,5,6. She died on August 18, 1851 in Guilford, Windham Co., Vermont 5,6. She is buried in the Blanchard (Old North) Cemetery, Guilford, Windham Co., Vermont. Hannah was baptized in Cohasset on December 20, 1778 3,8. She spent her earliest years in Cohasset. In 1782, when she was 3 or 4 years old, she moved with her family west to rural Warwick, in Franklin County, Massachusetts. Hannah was raised in Warwick, Massachusetts. She must have caught the attention of Thaddeus Bixby, a young man who lived in nearby Guilford, Vermont, where her sister Susannah was living. They were married in Guilford on December 6, 1802. She was 24 and he was 22. Hannah and Thaddeus resided in Guilford, Vermont, for the duration of their lives. There, they raised a large family of 9 children that reached adulthood. They were farmers, but Thaddeus also at times ran a distillery and a sawmill. Hannah married Thaddeus Bixby on December 6, 1802 in Guilford, Windham Co., Vermont. 1. History of the Town of Hingham, Massachusetts. 1893, Town of Hingham. 2. Blake, Rev. Jonathan. History of the Town of Warwick, Massachusetts to 1854. Noyes, Holmes & Co.: Boston, MA, 1873. 3. Davenport, George L. The Genealogies of the Families of Cohasset, Massachusetts. Cohasset, MA, 1909. 5. Bixby, Willard G. A Genealogy of the Descendants of Joseph Bixby, 1621-1701, of Ipswich and Boxford, Massachusetts. W. G. Bixby, New York City, 1914. 6. Daughters of the American Revolution Magazine. 1937, R. R. Bowker Co.
7. Tombstone inscriptions, Blanchard Cemetery, Guilford, Vermont. 8. Vital records of Cohasset, Massachusetts.